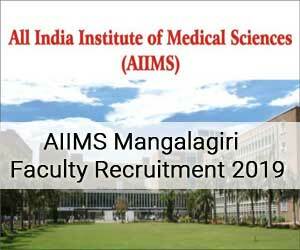 New Delhi: The All India Institute of Medical Sciences (AIIMS Mangalagiri), Mangalagiri has released 24 job vacancies for various faculty posts. The candidates will be selected through Personal Interview. The vacancies are for the posts of Professor, Assistant Professor, Associate Professor, and Additional Professor. AIIMS Mangalagiri is a Tertiary healthcare institute of national importance, established by the Ministry of Health & Family Welfare, Government of India under the Pradhan Mantri Swasthya Suraksha Yojna (PMSSY). Applications are invited from the Director, AIIMS Mangalagiri from the eligible Indian nationals including overseas citizens of India for the vacant posts on regular basis in AIIMS, Mangalagiri. Last Date for receipt of filled in application will be on or before 30th April 2019 till 5:00 PM. The Vacancies are in the Department of Forensic Medicine, Microbiology, Pathology, Pharmacology. Forensic Medicine: A Postgraduate qualification, i.e. M.D/MS in Forensic Medicine or a recognized qualification equivalent thereto. Microbiology: A Postgraduate qualification, i.e. M.D in Microbiology or a recognized qualification equivalent thereto. Pathology: A Postgraduate qualification, i.e. M.D in Pathology or a recognized qualification equivalent thereto. 1. A Postgraduate qualification, i.e. M.D in Pharmacology or a recognized qualification equivalent thereto. 1. A Doctorate (Ph. D) Degree from a recognized University/institute. Relaxable by five (5) years in case of post reserved for SC /ST candidates and three (3) years for the post reserved for OBC candidate as per rules of the Govt. of India. Relaxation for Persons with Disabilities is admissible as per rules. Relaxation of Five (5) years for Government servants as per rules. 1) Professor: Level 14A (168900 – 220400) as per 7th CPC with minimum pay Rs.1,68,900/- per month and other allowances as admissible. 2) Additional Professor: Level 13A2 (148200 – 211400) as per 7th CPC with minimum pay Rs.1,48,200/-per month and other allowances as admissible. 3) Associate Professor: Level 13A1 (138300 – 209200) as per 7th CPC with minimum pay Rs.1,38,300/- per month and other allowances as admissible. 4) Assistant Professor: Level 12 (101500 – 167400) as per 7th CPC with minimum pay Rs.1,01,500/- per month and other allowances as admissible. For General/OBC Category Rs. 3,000/- and for SC/ ST categories Rs.2,500/- to be paid through NEFT/RTGS/Cash deposit/fund transfer in the given bank account. The Application fee is non-refundable. No application fee is to be deposited for PwD (Persons with Disabilities) candidates. Name of account holder: AIIMS Students Account. 1. The aforementioned vacancies include the vacancies advertised by JIPMER, Puducherry vide Advt. No. JIP/AIIMS(Man)/2018/02 dated 07.02.2018 in the aforementioned departments only. 2. The candidates who have already applied for the respective post in the aforementioned subjects as per Advt. No. JIP/AIIMS(Man)/ 2018/02 dated 07.02.2018 also need to apply afresh and pay the difference of amount for the application fee in the same rank/post applied as per the details given in this notification. For Example: Candidate A has applied for Assistant Professor as per the Advt. No. JIP/AIIMS(Man)/2018/02 dated 07.02.2018 with the payment of Rs. 500 as Application fee. The candidate has to apply afresh for the post of Assistant professor as per this notification and pay the difference of amount (Rs 3000 – Rs. 500) i.e. Rs. 2500 as Application fee. 3. If the candidates are applying for the different rank/post, they need to pay the full application fee as per this notification. For Example: Candidate A has applied for Assistant Professor as per the Advt. No. JIP/AIIMS(Man)/2018/02 dated 07.02.2018 with the payment of Rs. 500 as Application fee. If the candidate wants to Apply for the post of Associate Professor as per this notification, the candidate has to apply afresh and pay the Full amount of Application fee as per this Notification. 4. The above vacancies are provisional and subject to variation. The Director, AIIMS, Mangalagiri reserves the right to vary the vacancies including reserved vacancies as per the Govt. of India Rules/Circulars and requirements or otherwise.